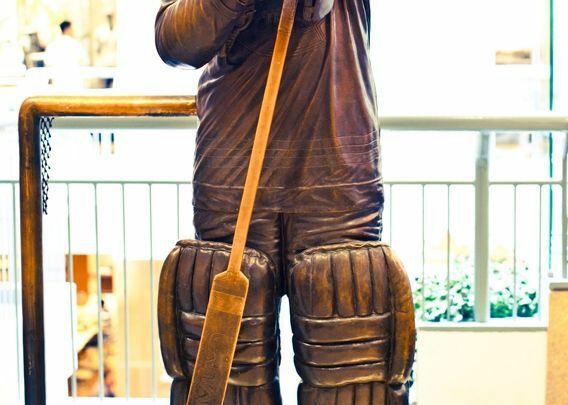 THE GOALIE is a cast bronze sculpture that was created by Robin Bell. The molding was done at the Mariani Foundry in Pietrasanta, Italy. The sculpture is life-size; it measures 196 centimeters and weighs about 400 kilograms. Since August 2011, the statue can be admired by all at Place Montréal Trust, at the Metro level. THE GOALIE is exposed in the shopping centre to pay tribute to Ken Dryden, one of the most famous goalkeepers that hockey has ever known. Ken Dryden was part of the Montreal Canadiens team from 1971 to 1979. During this period, the team won the Stanley Cup six times and Ken Dryden was awarded the Vezina trophy on five occasions.